Supermodel Joan Smalls caps off a phenomenal year with a larger than life turn in Vogue Italia's December 2014 issue for the editorial "It's all about gesture". Star photographer Steven Klein captures Smalls in duel roles for the sci-fi multi-media themed story. Smalls plays her own arch nemesis donning a blonde kewpie doll wig and futuristic designs selected by fashion editor Tonne Goodman. The editorial examines society's pre-occupation with digital-media in chronicling and documenting our every waking move. 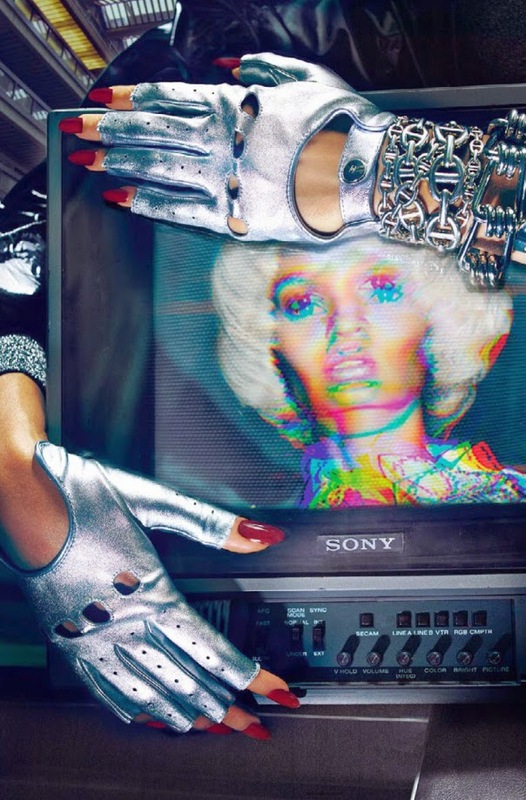 Smalls' supermodel form is given double exposure in the editorial with her image appearing on television monitors, projection screens, iPads, and the old fashioned polaroid. The Puerto Rican modelling export has enjoyed stratospheric success throughout 2014 scoring her first American Vogue cover alongside the industry's hottest "Instagirls", and shows no signs of slowing down with back-to-back Spring/Summer 2015 campaign slots for Marc Jacobs and Balmain, a coveted spot in Pirelli's 2015 calendar, and a turn on the runway at this year's Victoria's Secret Fashion Show. Smalls' mass market appeal to both high fashion and commercial clients ensures her full exposure for many years to come.